To set up the game, pick a number of vocabulary words that match the number of openings in your muffin tin. Have your child cut a sheet of paper into narrow strips. He should have at least as many strips as vocabulary words. Write each vocabulary word on one of the strips of paper. Fold each strip of paper and tuck it into its own muffn tin opening. Have your child take the ball and gently toss it into one of the spaces. Let him pick the folded paper out of the tin. Which word did he pick? Have him define the word. If you're using a vocabulary list from school, prompt him to get as close as possible to the exact definition he'll be tested on. Either way, encourage him to use his own words too. Understanding what a vocabulary word is enough to explain it in his own words is ultimately more important than the ability to give a memorized definition. Remove that word from the muffin tin. Keep letting him toss the ball and define the words until the muffin tin is empty. Place all the words back in the muffin tin. Have your child take the ball and toss it into one of the spaces just like before. This time, have him use the vocabulary word in a sentence. Challenge him to come up with complex sentences that demonstrate the meaning of that word. Feel free to add some of your own sentences for him to learn from. Play out the game like before until the tin is empty. Who's ready to ace his vocab test now? 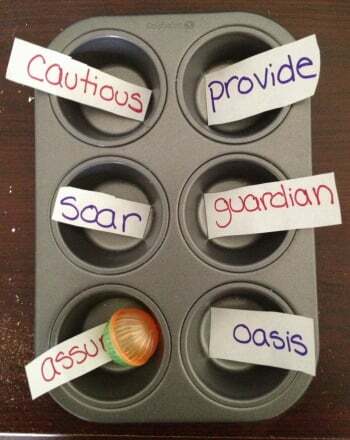 While this muffin tin vocabulary game is an effective solo activity, it's even more fun to play to with at least two or more kids. Each player will toss the ball, but the word he lands on will be defined by the player to his left. If he misses, the player to his left doesn't have to define a word! Challenging, educational and full of playful competition? Now that's an afternoon activity you can fully endorse. Your child will become a spelling maestro after completing this practise test, full of music-related words. Your child can get a head start on spelling with this test, focusing on the many different careers your child has to choose from. Your child can achieve spelling stardom with this silver screen-themed spelling test especially for 4th graders. Your student will be able to navigate difficult words with ease after he completes this test that combines spelling and social studies smarts. Combine spelling and social studies smarts with this two-in-one test that practices spelling and the names of U.S. states. 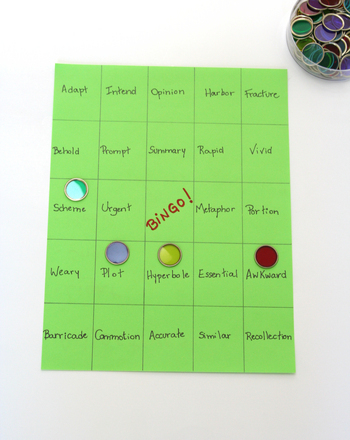 This easy twist on the classic game is a great way to build your child's vocabulary.